Ask A Filipino! : Why is karaoke so popular in the Philippines? thanks for answering my question! :)). when you mentioned singing build me up i suddenly remembered me singing spice girls as a kid. too embarrassing, really. i liked the chart you made. everything you wrote there was so true. that's exactly what goes through my mind whenever i pass by someone doing karaoke. Anyway, if you are indeed Chloe, you're welcome and hope to see more of you around. Sorry it took a little while to answer your question. Thanks for sharing that piece on FB. Oh Yeah Filiponos love to sing, if Koreans do drink alcohol like water, Chinese really will eat anything, the Japanese are all-around freaks.. then filipinos can spend all day long to have karaoke for fun... Seriously, it’s like Filipinos are born with a musical gene. 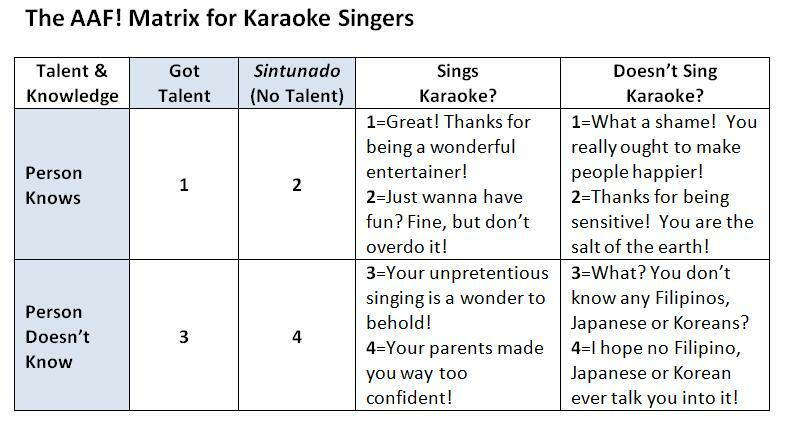 OK, so we understand why Filipinos love to sing videoke. But why must some always sing it at full volume until very late at night with no regards to people living nearby with children trying to sleep, workers trying to sleep for early shifts the next day, but someone is screaming out videoke at 4am and disturbing everyone?? No respect for neighbors? I see it everywhere. All are full volume. Posting a sign isn't going to do the job. Filipinos LOVE tearing down signs, or peeing on them (Bawal Umihi Dito signs especially). Calling the police does the job and that's what we do. Here's the problem in the Philippines. There's no discipline. Filipinos hate giving discipline and they hate receiving discipline. This country is full of people who avoid confrontation at all cost and pout for weeks on end if they are told off. Even when we call the police they try to avoid the issue and tell us to call the Barangay. And guess what? The Barangay is run by uneducated idiots and are usually the ones singing karaoke. Luckily we are a business and our tax dollars that pays their salary is a bit more important than some drunk squatter's feelings so the police get over their fear of discipline and get them to turn it off. Why Filipinos love to sing? Simply, they really love music. Once they sing, they feel they are part of the song or they relate in every line of the lyrics so even they are out of tune - it's fine, as long "may puso". 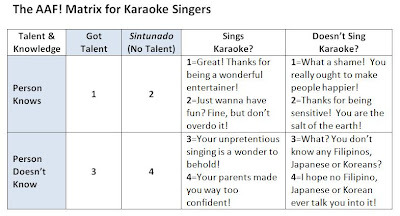 This is maybe one reason why karaoke machine in the Philippines is famous.